In the far future, humans have expanded into the universe and left Old Earth behind. But some old institutions still remain: slavery, patriarchy, the Roman Catholic church, a hereditary monarchy, and an aristocracy that descended from today’s Fortune 500. The current emperor has nine daughters and no sons. In order to keep the crown in his family, he changes the law to allow women to enter The High Ground, the military academy (required for ascension to the throne). Thus, his teenage daughter Mercedes, along with a couple of her retainers, will be the first women to enter The High Ground. Her father has charged her to become an officer and to find a military husband who will help her when she becomes empress. On the other side of town, a very smart boy named Tracy, the son of the emperor’s tailor, has won a full scholarship to The High Ground. He doesn’t want to be a soldier, but his father can’t afford to send him to a different university. When he arrives at The High Ground, clearly a scholarship student, he is bullied and ostracized by most of his noble classmates. Except for Mercedes. The two become unlikely friends. When a plot to harm the princess erupts, quick wits and strong force will be required. Melinda Snodgrass’s The High Ground (2016) is a fast-moving and entertaining military space opera. Tracy and Mercedes are pleasant characters, as are some of their classmates. World-building could be stronger. It’s hard to believe in this far-future society that is a blend of the Fortune 500 and the Roman Catholic church. Place and people names are Spanish. Aliens (who are not very alien) have been enslaved. The status of women has regressed significantly and birth control is illegal. (There is an explanation for this — aliens outnumber humans 10 to 1, so women should be home having as many children as they can.) While in many ways technology has progressed quite a lot, in other ways it feels like it hasn’t. It’s a strange mix of ingredients and I had a bit of trouble getting lost in the story for that reason. My biggest issue, though, is the speed at which Tracy and Mercedes’ relationship develops. Their friendship/romance is crucial to the story, but it develops off screen and is a surprise when we learn of it. I didn’t feel it at all. But still, I like these kids and want to find out what happens to them. Though The High Ground’s main characters are teenagers, I don’t think this book is aimed at a Young Adult audience. I’ve already read on in the series and would say that the sexual content is inappropriate for teenagers (at least, I wouldn’t let my teenagers read it). 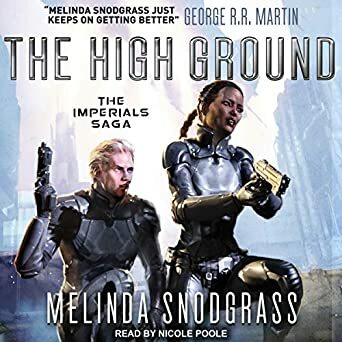 The audio version of The High Ground was produced by Tantor Audio and nicely narrated by Nicole Poole. Published in 2016. The Emperor’s daughter Mercedes is the first woman ever admitted to the High Ground, the elite training academy of the Solar League’s Star Command, and she must graduate if she is to have any hope of taking the throne. Her classmate Tracy has more modest goals — to rise to the rank of captain, and win fame and honor. But a civil war is coming and the political machinations of those who yearn for power threaten the young cadets. In a time of intrigue and alien invasion, they will be tested as they never thought possible. 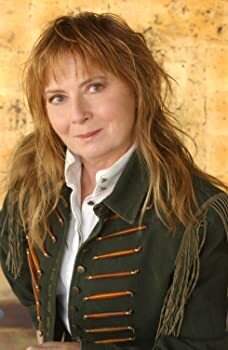 Because of Snodgrass’s extensive TV experience, I’m always curious about her plotting. It sounds like it does borrow heavily from the TV episodic one-hour structure. Yes, fast-moving, cool visuals, lots of action, but not particularly careful world-building or character development. Television has improved by leaps and bounds, especially when it comes to character development, but “fast-moving, cool visuals” virtually define that medium, so it might still be having an impact on her work.